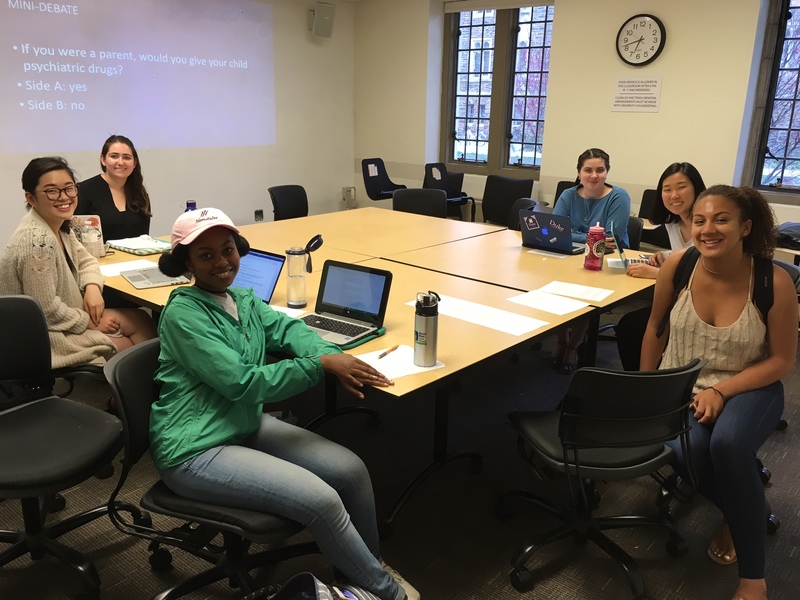 Image description: Six Duke students, a diverse group of young women, sit around a large table with laptop computers, paper, pens, notebooks, and water bottles. They are in a bright classroom with white walls, and are seated in swivel chairs. The students smile into the camera. On the wall behind them is projected the question, “If you were a parent, would you give your child psychiatric drugs?” A clock on the wall to the right shows that it is 6:42 PM. Two windows look out onto Duke’s West campus and a sunny spring day. This event — a discussion session organized by Olivia Lee — gave participants an opportunity to learn about the history and function of psychiatric drugs, and to engage in honest dialogue about the complexities of determining their effectiveness. “The other really good thing that happened was that the agitation and restlessness I’d felt for the last six years was all of a sudden gone. I felt much mellower,more relaxed,and at peace. It’s been wonderful.